I haven't read Bardugo's Grisha trilogy, but I was really excited for Six of Crows, particularly with its Ocean's Eleven heist elements. Much of the book delivered, but, for me, it stumbled at the end. I had super high hopes for Leigh Bardugo's Six of Crows after reading and loving an early preview. The first two-thirds of the story was enjoyable and full of the action, scheming and thieving I expected. Unfortunately, after that, it went from Mission Impossible to Mission Melancholy & Angst, which was not nearly as fun and kind of annoying. I was only really invested in two characters: Kaz and Inej. They're both intelligent, highly skilled, and somewhat devious; they're interesting and kept me guessing and engaged. When we hit the big switch in the last third of the book, their chapters became less about the current adventure and more about backstory. So, instead of seeing some of the cool/cruel, manipulative stuff Kaz executes on this job firsthand, we hear it recounted later in the space of a few paragraphs. I felt jipped, like instead of seeing the movie, they showed me the trailer, then skipped right to the end and told me about what happened. (And I'm still displeased with the author's rendering of Kaz.) The author pulled a similar stunt with Inej, but in this case we were inside the character's perspective as the scenes played out and the author kind of lied about the thoughts/plans going through Inej's head. I think you're supposed to say "that's so cool" later when you see how it fits into the bigger puzzle, but, again, I felt jipped. I know I'm picky about my romances, but pairing up everyone on the team was ridiculous. This is Mission Impossible, not Love Actually. That said, while I kind of got two of the pairings--one of which was so complicated and messy, who knew where it would end--I didn't buy the burgeoning relationship between the final two members of the gang. It felt forced and kind of out of nowhere and had a ring of that dreaded rule from "When Harry Met Sally," except now it's not just a man and a woman can't be friends--no one's safe. :P And half of that duo was a waste. I really wish he weren't sticking around in the next book. Honestly, after about two pages of screen time, I'm way more interested in a certain other character and would prefer to see more of him. He has a sadder, better backstory; makes a bigger, better explosion; is Grisha; and has a more compelling personality. All this in a couple pages. PLEASE trade out Wylan for this guy. 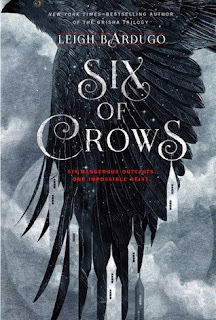 I liked the first half of Six of Crows more than the second, but at this point, I'm barely invested in one-third of the team, and who knows how much we'll see of one due to certain events at the end. Despite all the setting elements I liked and an Ocean's Eleven caper that had some good tricks, the job devolved into sentimental tripe and romance (half of which felt superficial and perfunctory) that reflected badly on the characters and didn't encourage me to continue the series. I actually stopped reading at 30% just because I was SO BORED. Nothing drew me in and I just wasn't excited about what was happening. SIGH! How interesting that you liked the first half more than the second. I've read a few other reviews where people said the opposite. In any case, I'm sorry you didn't like it! :( The story had so much potential! Thanks, Ashley! Usually a less than stellar ending doesn't affect my rating quite so much, but, like you said, it had SO MUCH potential. Which made the ending third extra disappointing. :( I kind of wish I'd taken your route and stopped when it ceased to entertain.